How can you interest millennials into investing? A concept screen showing how it could be used in the field. Our super team, left to right; Clifton, myself, and Annette. I was a part of a 3 person team, in which I was the lead visual designer. I assisted in the research phase, by conducting interviews, recording and compiling data. For the planning phase, I partook in the analyzing, assessing and compiling both the quantitative and qualitative data and mapping it out according to matching affinities. I created the first user flow and for the final phase of testing, we all took turns moderating the test and recording the data. It was clear that most millennials interviewed did not feel like they were doing enough. Capital One wants to become known more as a tech forward company and less as solely a bank or a credit card company. One way they plan to do this is to reach out to millennials who are notoriously untrusting of the Wall Street financial companies, and get them to start investing their money. Millennials, was our target group which we define as people between the ages of 20-34 years old. Contrary to popular belief, our target group does have money, and are willing to put money into savings. 52 percent of Facebook users who fit into our demographic are considered affluent. In our research, we found that this group did not really think about investing until they have a major life event (e.g. buying a house). Their number one financial priority was paying off debt followed by saving for a house and retirement. These are the features that users either liked, or would like. 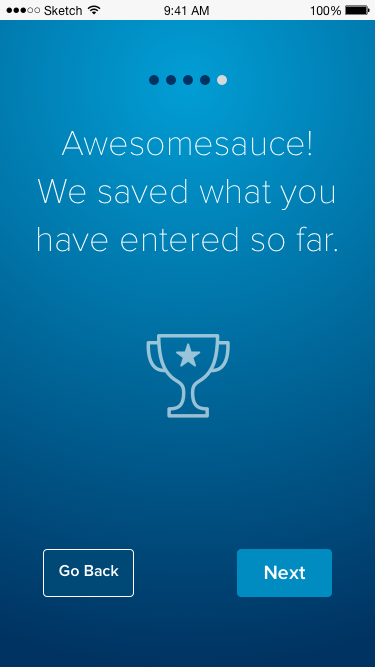 To get millennials to start investing their money, we felt it necessary to design an app that builds up trust between the user and Capital One. Our research showed that trust was very important, especially when it comes to linking up bank accounts to their phones. They have shown that they are willing to do this, as most have apps to their banks, and also most had Venmo, which is a person to person transfer of money app. In our user interviews, we dug deeper to find out how this trust was being built. First it was familiarity (word of mouth from friends), then it was the 2 step verification process within the app and heightening security. 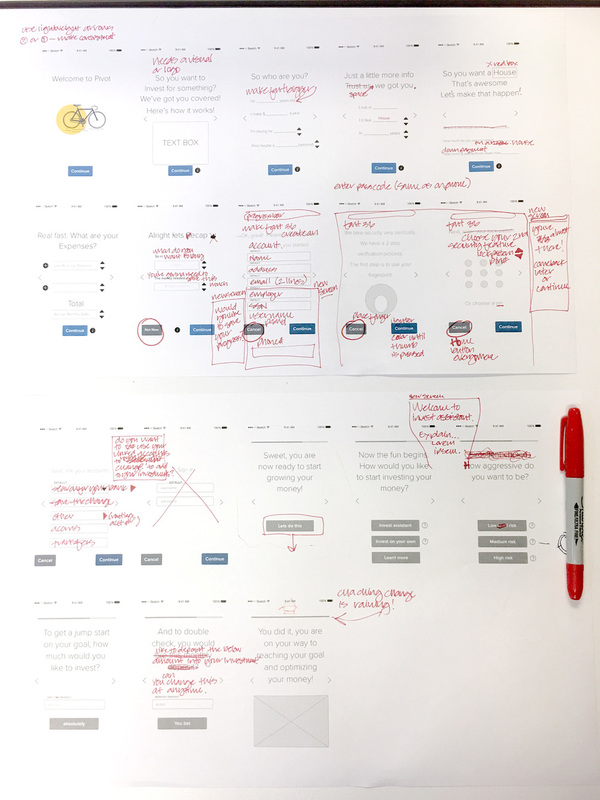 Having a design studio exercise helped us find out the user flow, and anticipate needs. To gain trust we did four things. First we established a progressive disclosure process that leads the user through a course of data entry built with sliders. Here, the user can freely slide inputs and enter and adjust financial figures in the calculator, without having to create an account. Our research showed that part of building trust was demonstrating the usefulness of the app for free. 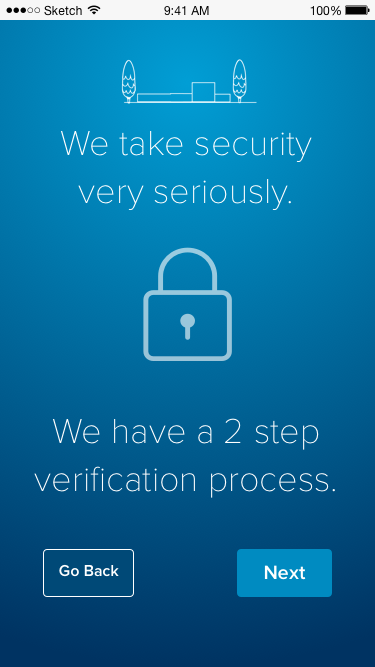 Second we wanted to create a 2-step verification process. This was an important step established in our interviews and an easy way to build trust. 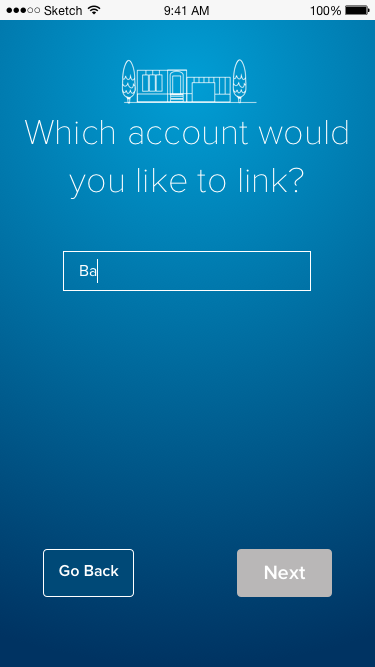 Third, I devised a concept for a progress bar that was based on the user’s goals. 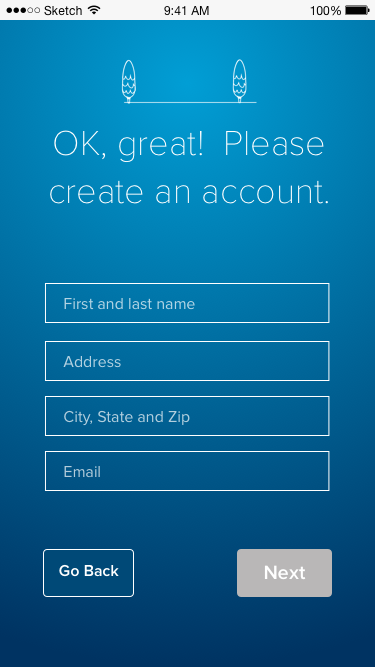 Once the account-making process has been started, an outline of the user’s goal would start to form. In the prototype, this is static, building as each screen progresses in the flow. In reality, it would animate, progressing through the flow. In the prototype example, a house is being built as you progress through the onboard process. 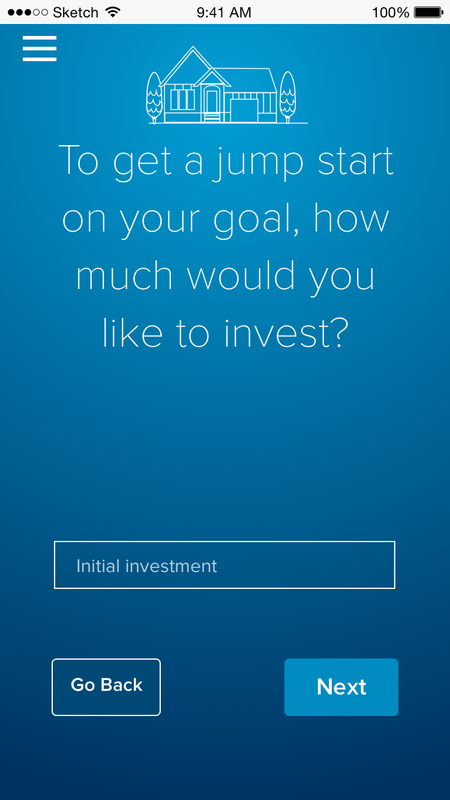 The user’s investment goal was established in the first section of the onboarding. 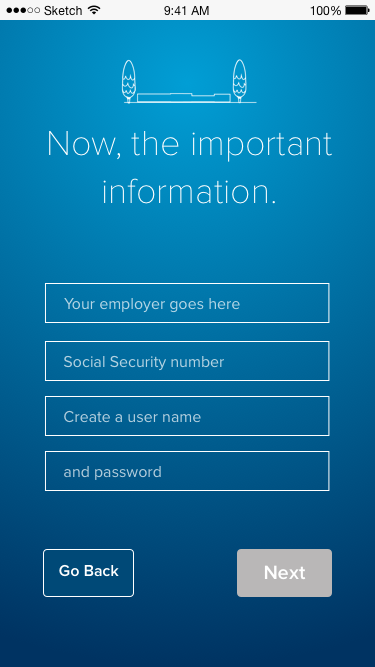 The user can establish a goal for saving up for a house, a gift for somebody, a new car, or just financial security. In our research, we found that millennials don’t really start thinking about investing until they had a major life event. This became the catalyst for them to make a pivot in their life. Lastly, we wanted to have an option to explore investing on your own, or use a proven portfolio balancing method that we can show has historically yielded higher ROI than personal investing strategies. 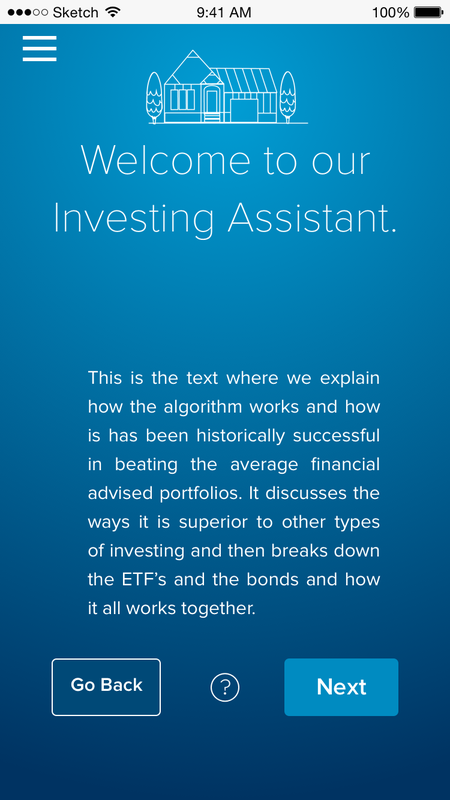 Our data suggest that millennials trust an algorithm more than a personal financial investor. 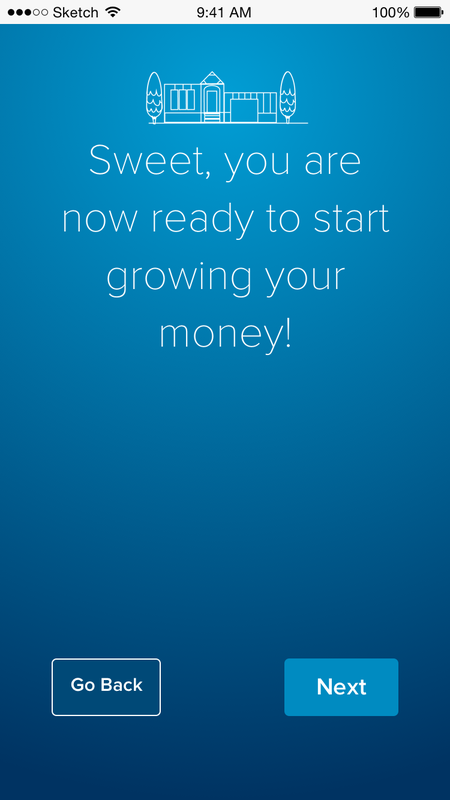 Once the whole process is completed, the app brings you to a dashboard, where you can see a graph showing how your investment is growing, and how you’re progressing towards your personal goals. Each time you open the app, the house continues to be constructed, based on how close you are to achieving your goal. 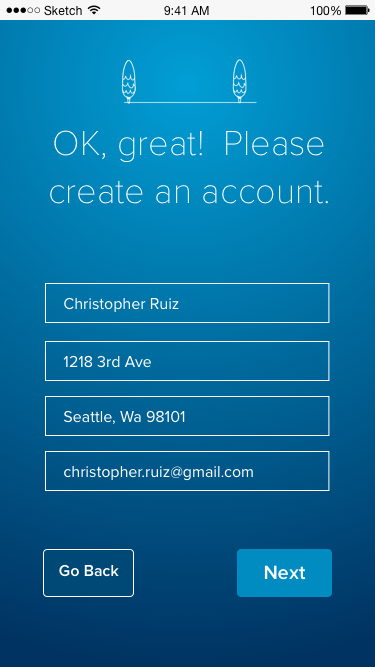 In any financial app, there are multiple layers of legal and financial disclosures that have to be gone through. 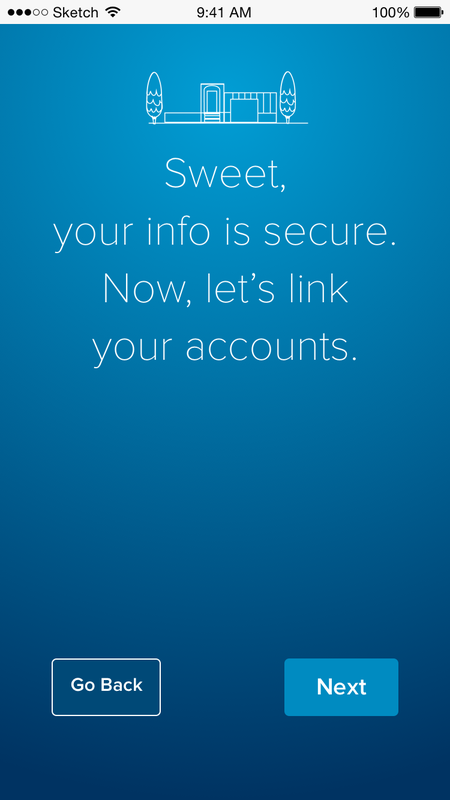 This means a lot of very sensitive personal information has to be passed back and forth. Even though millennials seem to trust sharing personal information more easily, there are still inherent trust issues with this process. 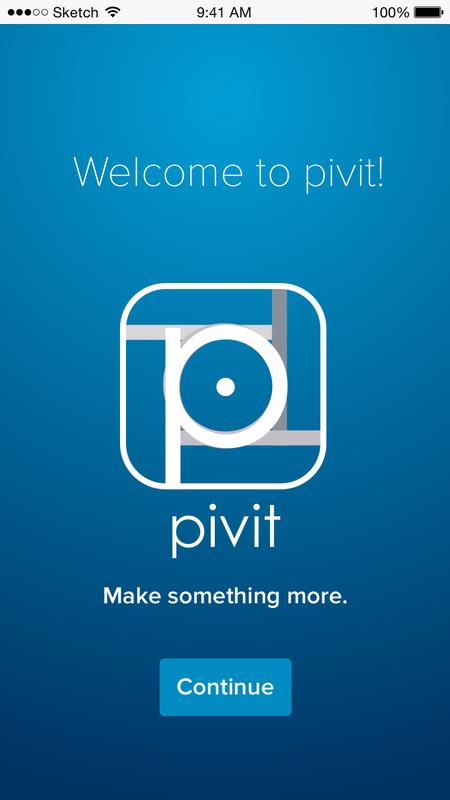 Another struggle in trying to create an app in three-week sprint, is time. When teaming up with a new group of people, it takes trial & error to establish the best method to start working with all cylinders. When there is research, planning, designing, and testing to do, and everyone wants their hands on every part, it often gets a little disjointed. It is my belief that we needed another week to fully test this app and make the necessary iterations to get it fully where I feel, conceptually, it could be. Our findings indicated that there is interest in this product, but it needs to be iterated on before sending it out for more thorough testings.